Only 4 Free Articles Remaining. Over the past twenty years, private donors have contributed a figure somewhere in the billions of dollars to support public services such as education, parks maintenance, and libraries. As Rick Cohen has observed, there now seems to be a charitable arm for every federal agency—from the CDC to the CIA.1 So far, judging from some high-profile cases like the dramatic “rescue by foundation” of the city of Detroit from bankruptcy, public and expert opinion has been divided as to whether governments—and taxpayers—should welcome this kind of philanthropy or whether we should be concerned about it. Complicating our ability—as voting citizens and also as scholars—to understand the impact of this public-oriented philanthropy is the lack of information about its scope and its long-term implications for public service provision, tax and budget policy, the nation’s philanthropic capacity, and a host of related issues. Scholars are still working on those questions, but the following is what we know so far. An examination of the growth in these government-supporting organizations reminds us that the legal definition of a “charity” via the tax code is broader and more inclusive than most people may realize. Among those activities allowable under section 501(c)(3) of the tax code are not only relief of the poor, distressed, and underprivileged, and advancement of religion, education, and science, but also activities that support public service provision. These include, for example, erection or maintenance of public buildings, monuments, or works; activities that lessen the burdens of government; and activities that lessen neighborhood tensions. Thus, on the face of it, charities created to support government services are hardly controversial from a legal standpoint. Legislators have also defended their efforts to create charitable foundations for public agencies by claiming that these new entities can bypass legal obstacles to public-private partnerships, increasing flexibility and minimizing red tape. It’s no coincidence that this disagreement is happening during a time of heated political debate over school “ownership.” The recession reduced public services in nearly every state, a result of sharp declines in state tax revenues.12 Meanwhile, conservative shifts in federal and state policy toward education have resulted in growth in nonprofit charter schools, shifts from local to state control of education budgets, and controversies over student testing and teacher seniority. These political fights reflect deep ideological divisions—even to the point of challenging fundamental assumptions about the public sector’s responsibility for public education. But it’s startling to find this discussion happening at a time when truant officers still roam communities to enforce compulsory public education. Why doesn’t the public’s obligation to educate its citizens extend to full school financing? It’s not so simple. Complex school finance policies limit the ability of school districts to raise their own source revenues. In other words, these local education charities offer a convenient way to get around both strict state policies on school funding and the political stalemates in state capitals. As a result, any rock-ribbed assumption that taxes should pay for public schools is probably on the table—or will be soon. But how much of this trend legislators and local officials will stomach is still to be determined. In Dallas and Los Angeles, school officials have proposed selling off naming rights to athletic facilities.13 Should we welcome the future “Paul Revere Middle School ‘McDonald’s’ Soccer Field”? Looking forward, whether or not philanthropy for schools will substitute for taxes in any substantive way, and what that signifies for tax policy, is something to which policy-makers and scholars should pay closer attention. 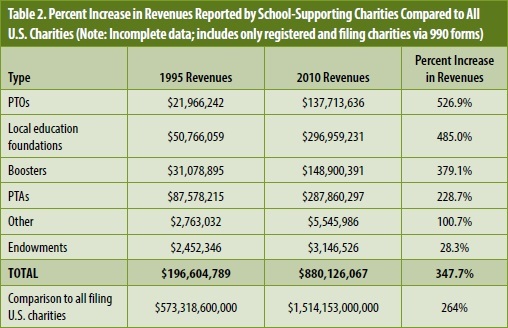 Donations to schools have been described as a “minor and highly variable source of revenue” and “…an ill-suited replacement for broad-based tax revenue.”14 Ten years ago that conclusion was still accurate, when the National Center for Education Statistics reported that less than 3 percent of public-school revenue came from philanthropy.15 A more recent estimate is needed. The field of recreation and natural resources management offers another instructive and often colorful view into the role of philanthropy in public service provision. Private donors also actively support public parks—through direct gifts and also by creating “Friends of the Parks” groups. Under active encouragement by all levels of government, both numbers and revenues have increased over time.17 For example, using partial data (National Center for Charitable Statistics Core Files for public charities) I estimate that parks-supporting charities of all kinds were created at a rough average of fewer than two per year up into the 1980s, but since then new organizations have been created at an average of more than twenty per year. At the state level, my research suggests that roughly half of all state parks across the United States now have an associated nonprofit “Friends of the Parks” group. These organizations provide a range of services, but their aims are quite similar on the whole. Among the 650 charities I have analyzed to date that support public parks at the federal, state, or local government level, 97 percent conduct fundraising to support parks programming, 63 percent recruit and manage parks volunteers, and 65 percent participate in parks maintenance and construction activities (e.g., trail maintenance). An additional 39 percent provide public education and outreach, and 32 percent provide recreational programs, while 15 percent engage in advocacy. So, on the whole, their principal purpose is quite clear: to bring in dollars and volunteers. Another similarity with schools is that parks, too, are geographically bound. A wealthy donor is more likely to support the park in her neighborhood than she is the pocket park across town. So unless cities create policies to support parks budgets equitably regardless of philanthropic input, as the city of New York has attempted to do, a reliance on philanthropy is bound to result in inequitable quality.25 Since neighborhoods have wealth and income disparities, so will parks and schools under a philanthropic regime. What Don’t We Know—and Why Does It Matter? Many private gifts directed toward government services appear to be short-term infusions of philanthropy, not intended to permanently replace tax-funded or fee-based public services. For example, private donors and foundations stepped in with millions of dollars—but only in the form of loans—to assure the continuation of some social services during the federal government’s shutdown in the fall of 2013.26 Perhaps the lure of a short-term commitment is also one of the reasons why many donors prefer to fund capital projects rather than ongoing programmatic or maintenance needs in public parks and spaces. But the data suggest, overall, that philanthropic funding for public services is neither a temporary nor a short-term trend. The fact that government agencies are creating entirely new 501(c)(3) institutions as vehicles for organizing volunteers and donors suggests that the goal is a permanent fundraising infrastructure. I expect those who attend the Association of Fundraising Professionals events are seeing more public employees enrolling to gain grant-writing training, as well. But we have not yet answered some important questions about this trend’s impact on public-service provision—including, as I’ve mentioned, some questions related to how private philanthropy affects equitable public access to services. As noted, my research so far suggests that it does so for education and possibly for parks, but the full scope and impact of these inequities are challenging to measure and require much more observation over time. I have written elsewhere and in more detail about the possible problems this trend introduces.30 They include a virtual Pandora’s box of potential ripple effects, including reduced public accountability and citizen access, less donor transparency, more-challenging power dynamics, and less-stable public services. But I, like other observers, need more information. In the meantime, policy-makers should allow themselves to be guided by more impact data before marrying themselves to these revenue sources. Rick Cohen, “Philanthropy Funding Government Work? There’s a Foundation for That—Several, Actually,” Nonprofit Quarterly, April 13, 2012. 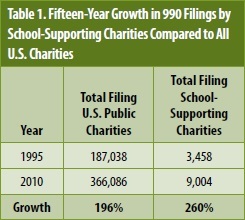 Unpublished analysis of filing public charities via National Center for Charitable Statistics Core Public Charity data. Ashlyn Aiko Nelson and Beth Gazley, “The Rise of School-Supporting Nonprofits,” Education Finance and Policy 9, no. 4 (Fall 2014): 553. Eleanor Yang Su, “Public Schools Increasingly Rely on Private Donations,” ABC7news.com, January 19, 2012. Nelson and Gazley, “The Rise of School-Supporting Nonprofits,” 553. Beth Gazley and Ashlyn Aiko Nelson, “The Shoe’s on the Other Foot: Government Reliance on Private Philanthropy” (paper presented at the annual meeting of the Association for Research on Nonprofit Organizations and Voluntary Action, November 23, 2013, Hartford, CT). “Impact,” DonorsChoose.org, accessed January 15, 2015. Motoko Rich, “Nation’s Wealthy Places Pour Private Money into Public Schools, Study Finds,” New York Times, October 21, 2014. Nelson A Rockefeller Institute of Government, “Personal Income Tax Revenues Show Significant Softening in the Fourth Quarter of 2013,” State Revenue Report 95, April 2013. “La Cañada School District May Sell Naming Rights,” L.A. Now (blog), Los Angeles Times, October 27, 2011; and Matthew Haag, “Dallas ISD to Consider Selling Naming Rights at Schools, Stadiums,” Dallas Morning News, July 5, 2011. Renee A. Irvin and Patrick Carr, “The Role of Philanthropy in Local Government Finance,” Public Budgeting & Finance 25, no. 3 (September 2005): 33. Janet S. Hansen, “The role of nongovernmental organizations in financing public schools,” in Handbook of Research in Education Finance and Policy, ed. Helen F. Ladd and Edward B. Fiske (New York: Routledge, 2008), 314–31. School Support Organization Financial Accountability Act, Tenn. Code Ann. § 49-2-2. See, for example, “Support Parks,” National Park Foundation, accessed January 15, 2015. Tom Wharton, “Utah State Parks on Verge of Closure,” Salt Lake Tribune, October 20, 2011. U.S. Department of the Interior, Budget Justifications and Performance Information Fiscal Year 2015: National Park Service (Washington, DC, 2014). U.S. Senate Committee on Energy & Natural Resources; Democratic News; “Wyden Calls for Creative Fixes for National Park Maintenance Backlog,” blog entry, July 25, 2013. Len Barcousky, “$40 million raised for Flight 93 National Memorial,” Pittsburgh Post-Gazette, September 9, 2013. Douglas S. Noonan, Tracy Yandle, and Beth Gazley, “‘Friending’ the National Parks: Where Nonprofits Help to Conserve Public Resources” (working paper, School of Public and Environmental Affairs, Indiana University-Purdue University Indianapolis, 2014). Kelly Kleiman, “Open Access vs. Donors’ Influence,” Christian Science Monitor, September 29, 2004. Margaret A. 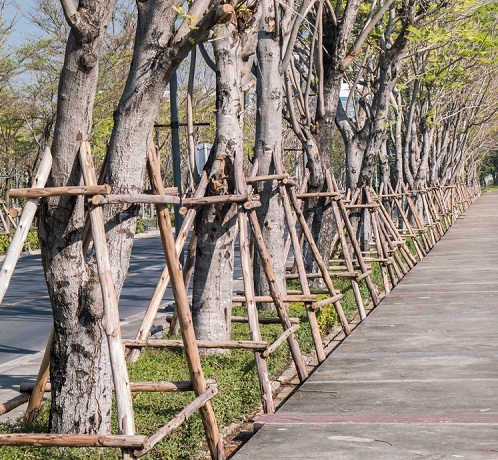 Walls, Private Funding of Public Parks: Assessing the Role of Philanthropy (Washington, DC: Resources for the Future, 2014). Beth Gazley, “The Dangers of Shutdown Philanthropy,” Chronicle of Philanthropy, October 14, 2013. “‘Forever Open, Clear and Free’: Ending the Grant Park Land Grab Liberates the Children’s Museum for a Brilliant Rebirth at Navy Pier,” January 29, 2012, Chicago Tribune; see also Lois Wille, Forever Open, Clear, and Free: The Struggle for Chicago’s Lakefront, 2nd ed. (Chicago: University of Chicago Press, 1991). Beth Gazley is associate professor, School of Public & Environmental Affairs, and affiliate faculty member, Lilly Family School of Philanthropy, both at Indiana University. Only 3 Free Articles Remaining. Many feel that privatizing public services is a contradiction in terms and leads to any number of problems; and, in the context of human services, inattention to matters of geography appears to result in misallocation and/or unequal quality of delivery—unsurprisingly, with the highest levels of inadequate or distressed providers correlating with less well-off communities. Mapping service providers, says the author, can enrich the debate and help us to grapple with these spatial concerns.